Petroleum Services is a registered distributor and installation specialist of Maxair plastic compressed air pipelines. Plastic pipelines have been used to transport compressed air for many years. 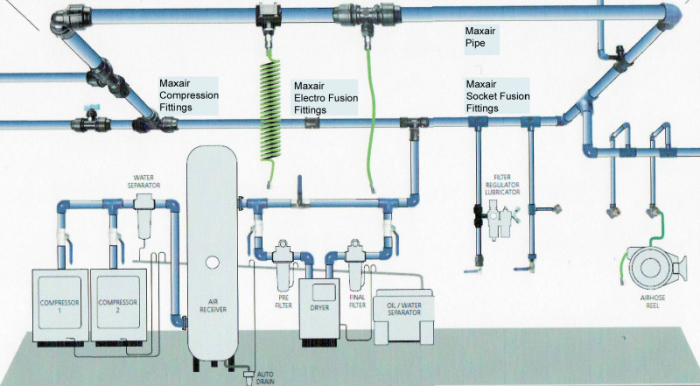 Maxair pipe systems utilise PE100, a product of advanced materials technology which outperforms other pipes for pressure, flow, corrosion resistance, compatibility with compressor oils & ease of installation and alteration. Complementing this outstanding development in clean robust pipework is a comprehensive range of quality components to help you select the best solution for your individual requirements. This range is a result of research and experience within a broad cross section of industrial applications. Petroleum Services has over ten years experience installing, maintaining and servicing compressed air line systems. Compressed gasses have inherent dangers, so an uncomprimising standard of quality, expert installation, conservative pressure ratings and the highest safety factors of any polymer piping system as set out in New Zealand standards are now available to you. Maxair is manufactured in accordance to AS 4130/AS 4131 and is accordingly guaranteed for 50 years provided recommended design, installation and operating practices are adopted. Maxair may be operated continuously under pressure for up to 200 years at 20deg C.